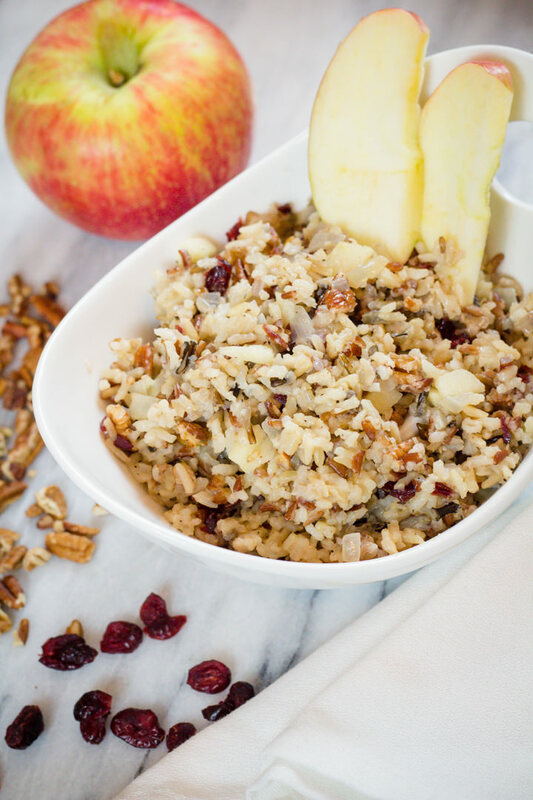 With so many Fall flavors this Apple Pecan Cranberry Wild Rice Pilaf is a wonderful Rice Bowl with so many flavors and textures. It’s wonderful. All the flavors of Fall in one dish. 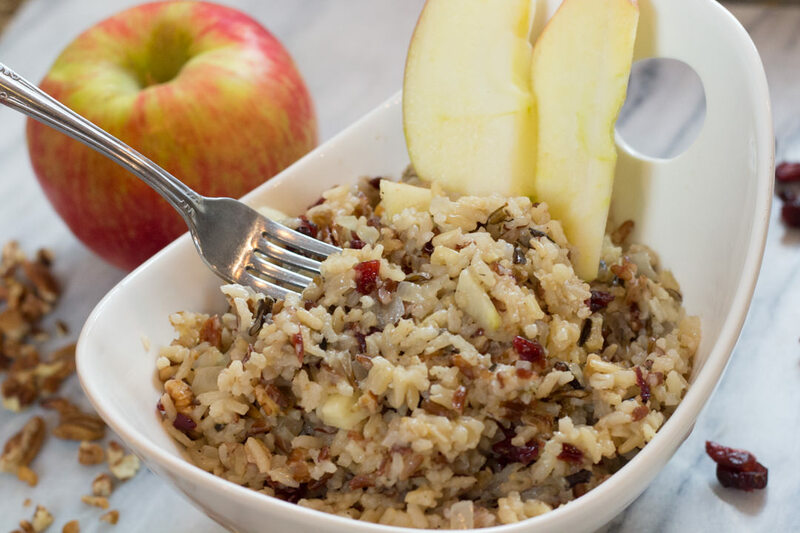 Apple Pecan Cranberry Wild Rice Pilaf can be eaten as a side dish or my favorite as a Lunch Rice Bowl. With so many textures and flavors this Wild Rice Pilaf is amazing. We also love to serve this as a side dish with a Rotisserie Chicken as the flavors balance nicely. 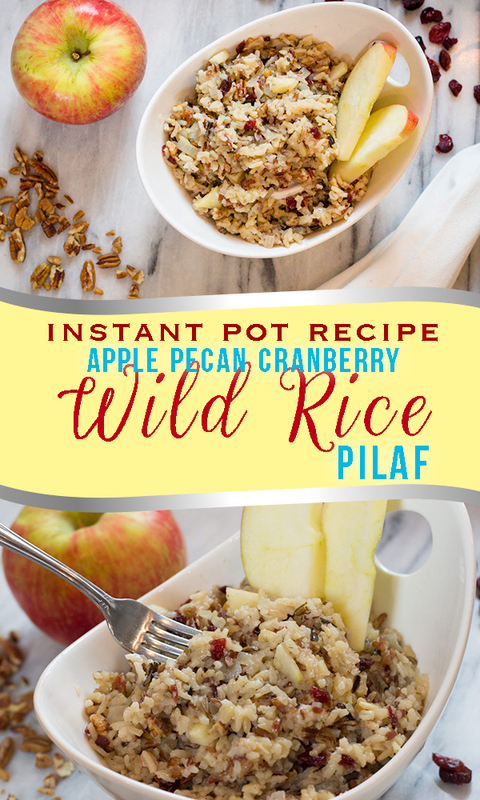 Regardless of how you eat Wild Rice Pilaf, you will love all the flavors. 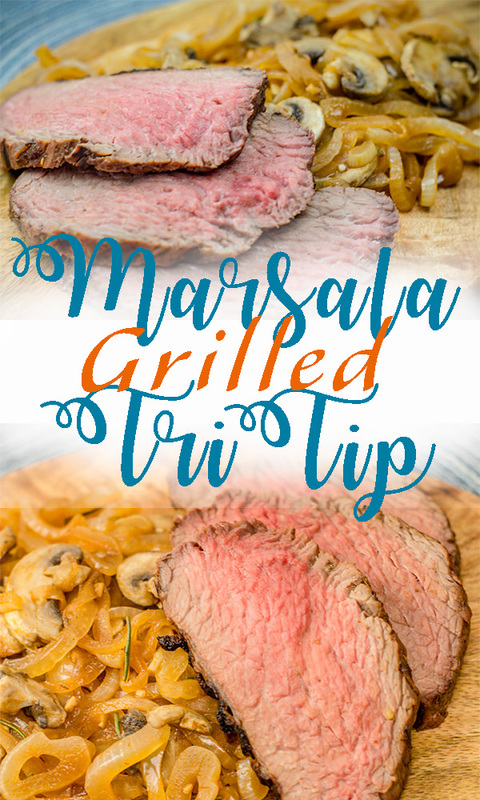 We make this recipe in both the Instant Pot and on the stove top. It will take a little more time on the stove top, but is just as easily made. However, the Instant Pot steps are super simple and easy to throw together. 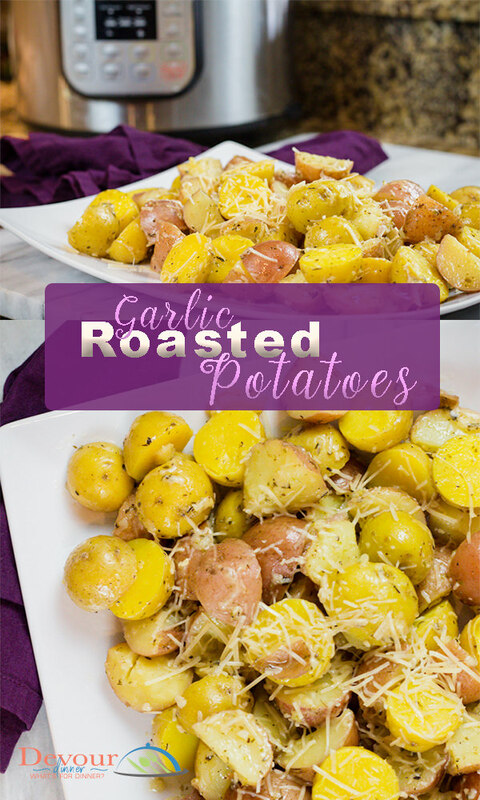 We first found this recipe when looking for an alternative to potatoes at Thanksgiving Dinner. I know, shock right? Who doesn’t like potatoes for Thanksgiving? Well, we just needed an alternative for some guests. 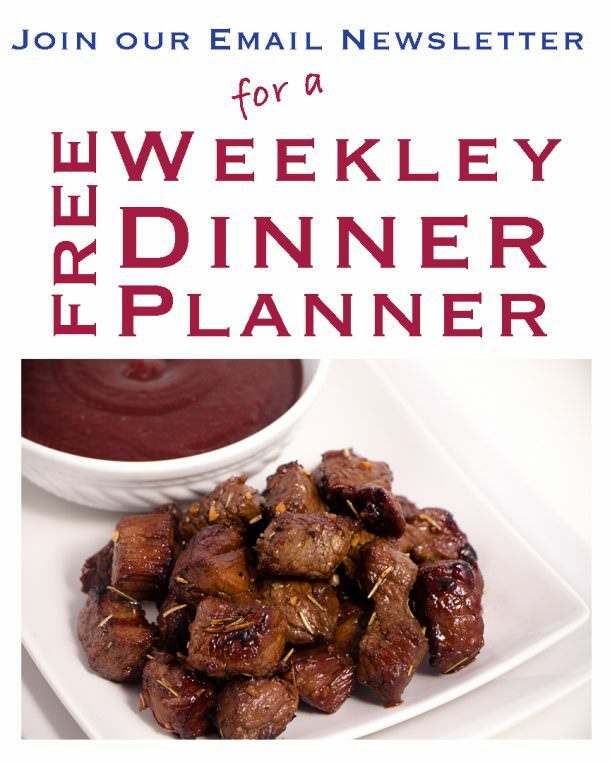 This recipe fit nicely and complimented our table of beautiful food nicely. 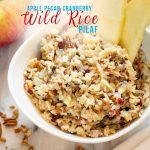 I love the texture of the added diced apple pieces with the pecans and craisins, it just adds to the wild rice texture making this a perfect Wild Rice Pilaf Bowl for lunch or Dinner. 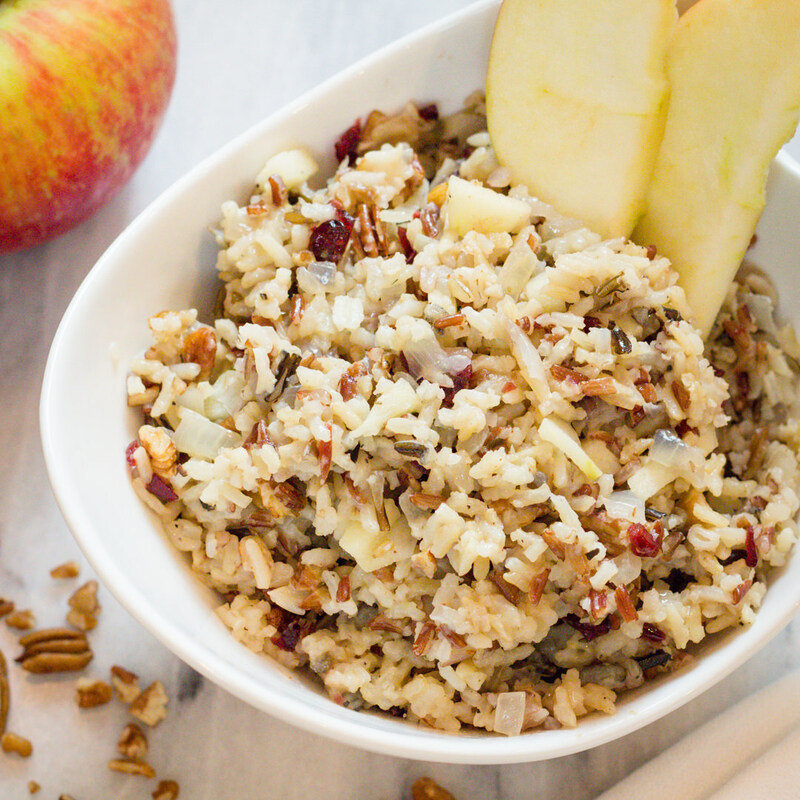 What do you serve Wild Rice Pilaf with? Great question! We love to eat this recipe by it self as a Rice Bowl, but we also serve this with a Rotisserie Chicken and some fresh veggies. How Long does it take to make Wild Rice Pilaf? This recipe is quick made in the Instant Pot and can be made in under 30 minutes. 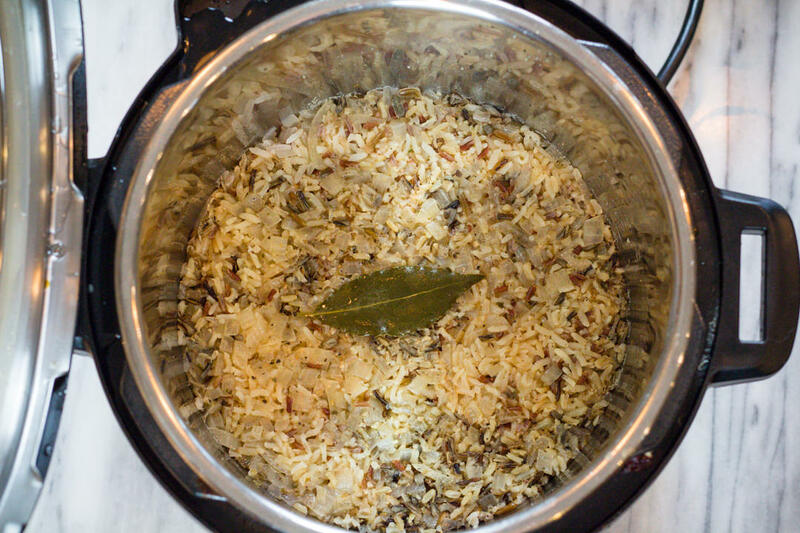 The stove top recipe takes a little longer as it just takes time to cook Wild Rice. Can I leave out ingredients? You sure can! We love to adapt recipes to our tastes. You can adjust or remove all ingredients. However, the liquid amounts must stay the same. You can however use all water or broth or all apple juice. 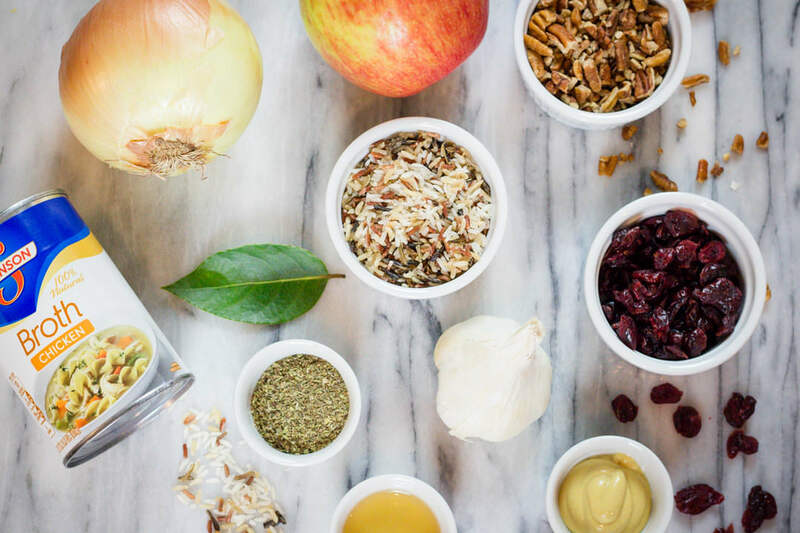 How many servings will Wild Rice Pilaf make? This recipe will make 4-6 servings as a side dish or 1-2 servings as a rice bowl. Wild Rice needs to be rinsed and drained to remove the extra starch. Make sure to rinse with cool water and drain well before adding to recipe. 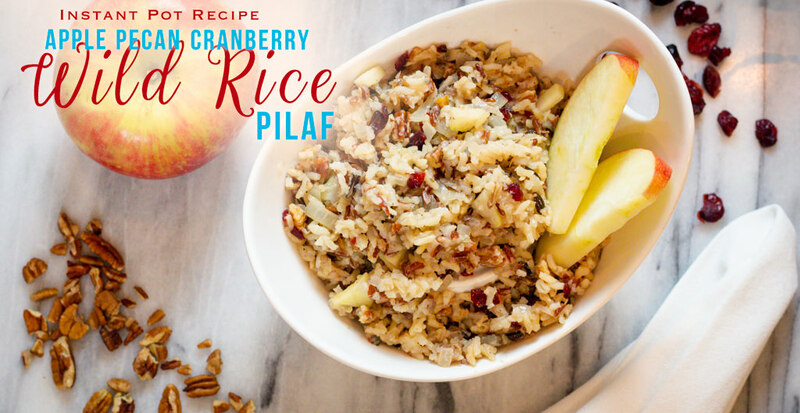 Wild Rice Pilaf with Cranberries, Pecans and Apples is a Fall favorite side dish recipe for the Instant Pot and stove top recipe. Packed full of flavors and textures make this Pilaf a favorite all by itself for a lunch bowl. Measure wild rice blend, wash and drain and set aside. Turn Instant Pot to Saute' and wait until it reads "hot". Add butter, garlic and diced onions. Stir and sauté for 2-3 minutes. Then Turn pot off. Set to Manual for 21 minutes. Then 5 minute Natural Release and then Quick Release. Open Lid and remove Bay Leaf. Add diced apple, craisins and chopped pecans and stir into rice. Close lid for 2-3 minutes. This allows the apples, craisins and pecans to warm up. Serve as a side with a meal, or eat as a Rice Bowl for lunch. Enjoy! In a frying pan, heat butter and add diced onions and garlic. Saute for 2-3 minutes. You do not need to full cook the onions as they will cook along with the rice. In a separate bowl mix broth, apple juice, mustard, salt, pepper, and oregano and stir to combine. Please note. For this recipe you will need to increase your broth to 1 1/2 cups and apple juice to 1 1/2 cups. Allow rice to cook on low for 45 minutes or until rice is done. Try not to remove lid as heat escapes and changes cooking time. When rice is done, Remove Bay Leaf. Then Add diced apples, craisins, and pecans. 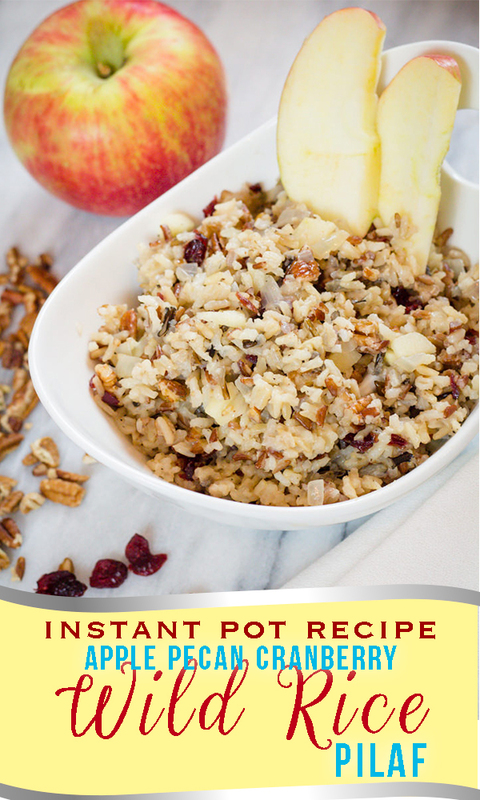 Give a quick stir to combine and cover with lid for 2-3 minutes to allow the apples, pecans and craisins to warm up.